Our trip across the Strait of Georgia was smooth and uneventful (always a good thing). 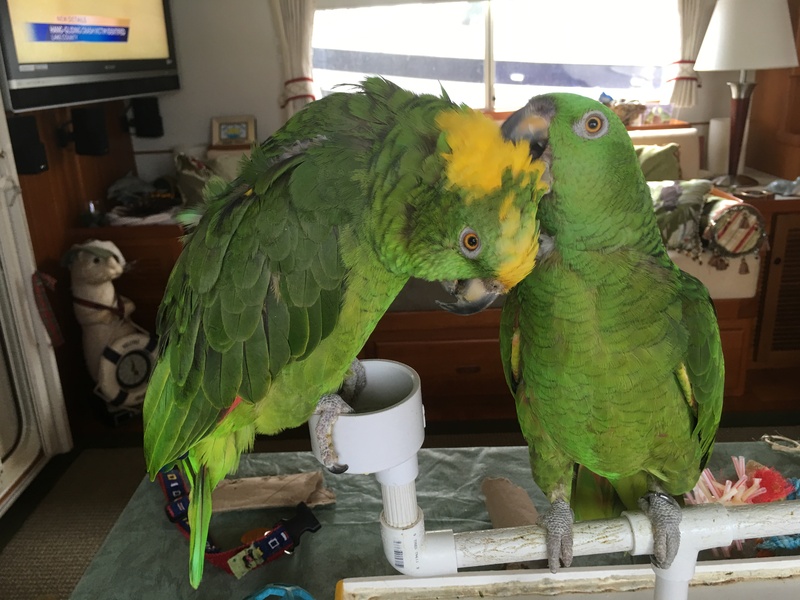 We made an overnight stop in Nanaimo to drop off the two parrots at a pet sitter. We are heading to the U.S. for a Krogen Rendezvous in a few days and our government makes it very difficult to cross the border with the birds. Dianna met us at the docks and will keep Nate and Primo at her home until we return to Canada. I think they will have a great time with her. The next morning we transited Dodd Narrows at slack along with about twenty other boats (again blessedly uneventful). 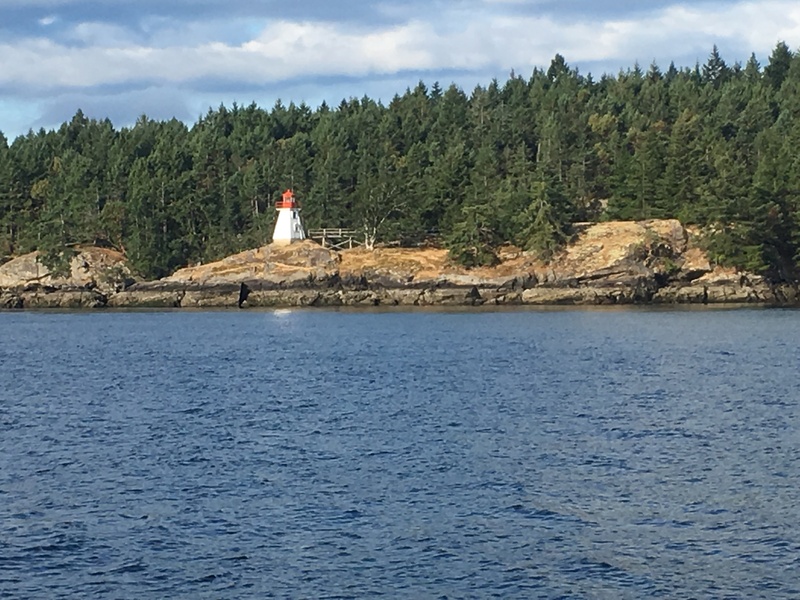 Our anchorage for a few nights is Montague Harbor on Galiano Island which is part of Canada’s Northern Gulf Islands. Montague Harbor is very large with room for over 100 boats to anchor and is well protected from any winds. The Marine Park on the north end of the island is beautiful. 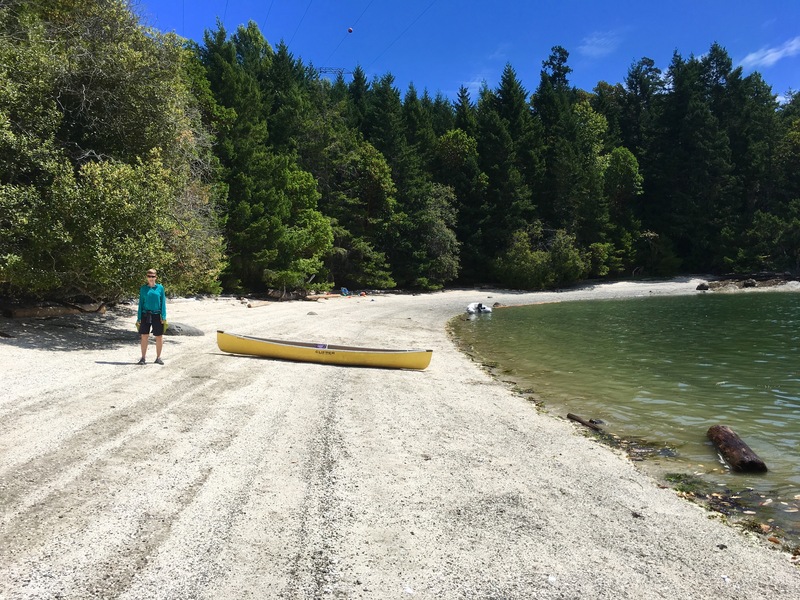 We enjoy walking the trails and admiring the beautiful sandy beaches. Our primary reason for stopping here was to ride “the bus”. 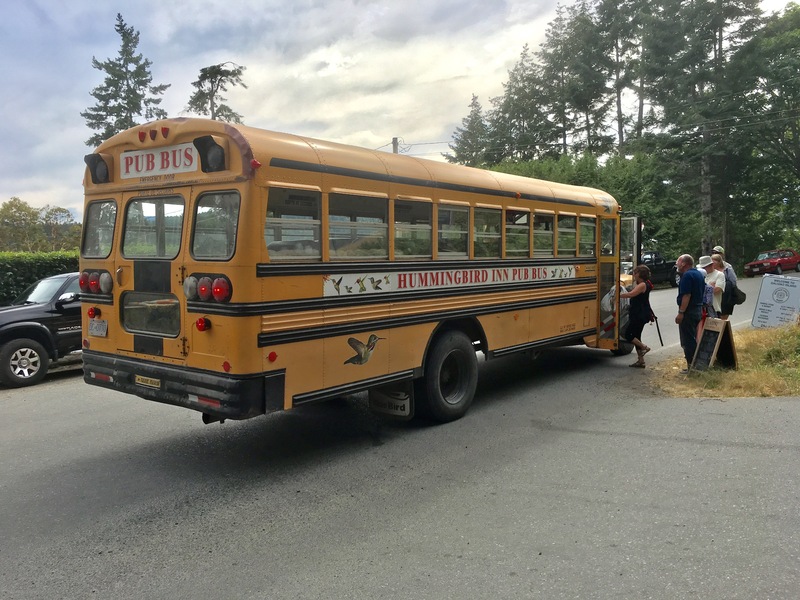 Each evening the Hummingbird Pub offers a free shuttle from the marina to their restaurant aboard a vintage yellow school bus. 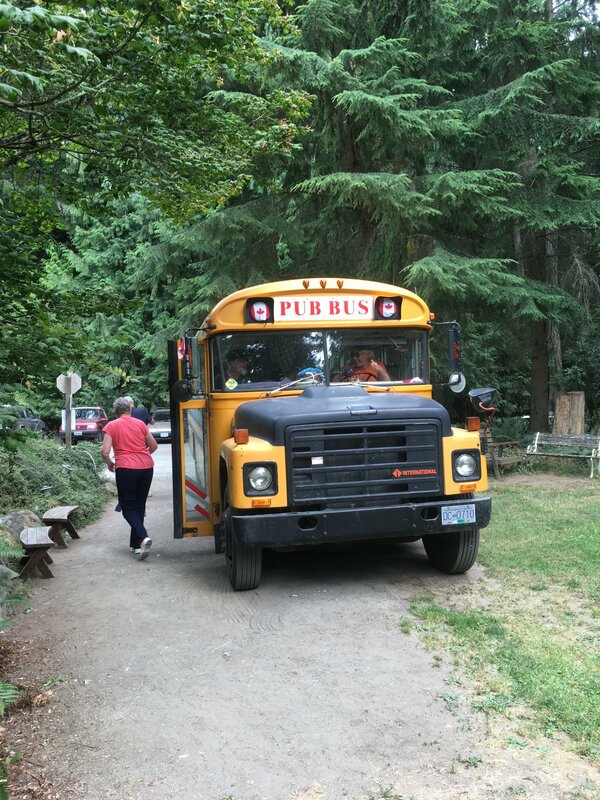 Every since arriving to the PNW, boaters keep telling us to go ride the bus. 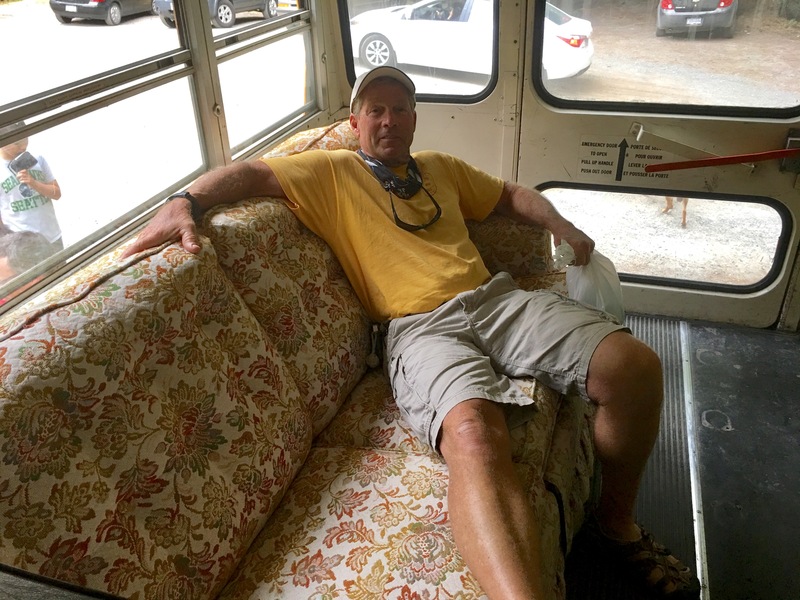 It is not so much the destination but the experience aboard the bus that keeps boaters coming back year after year. Not knowing what to expect, we climb aboard and are handed a musical instrument by Tommy, the bus driver. The musical instruments are a variety of well used tambourines, shakers, cow bells, clackers, and other noisy contraptions. Above the buss drivers seat is a drum set, cymbals, and cow bells. The back end of the bus is outfitted with a lazy boy chair and couch that looks to be 30 years old. We knew immediately that we were in for a unique ride. 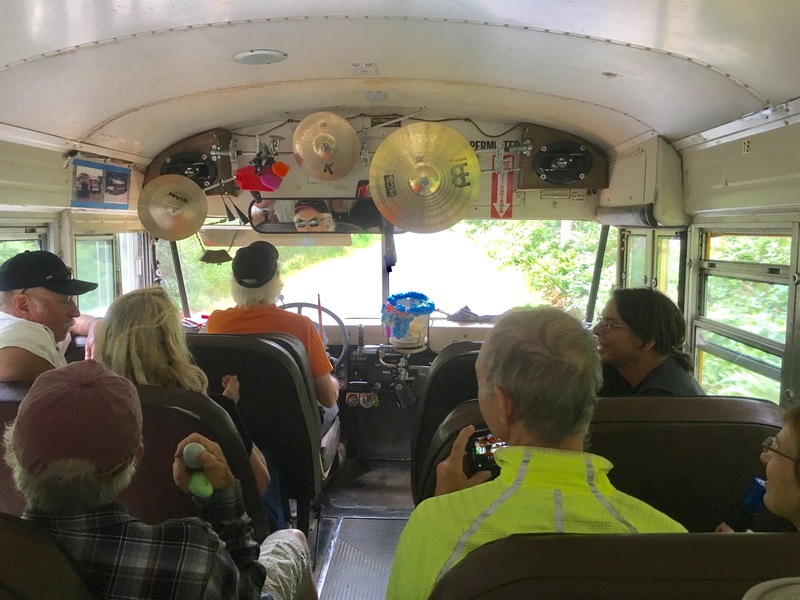 Tommy’s miked voice over the bus PA system overlaid with blaring rock music is accompanied by the riders percussion beat as we traverse the windy and hilly main road. Tommy’s rapid fire monologue is peppered with Island facts and witty NW humor. At times it is questionable weather the bus will stay on the road as his attention is easily diverted from the windshield to the passengers behind him. The overall experience is highly entertaining. This unique bus ride is enjoyed both coming and going from the pub. Tommy has a truly unique personality and is a great asset to the Galaino Island community. This entry was posted on October 6, 2017 at 5:16 pm. You can follow any responses to this entry through the RSS 2.0 feed. You can leave a response, or trackback from your own site.